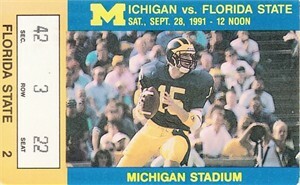 Sept. 28, 1991 Florida State at Michigan college football ticket stub won by the Seminoles 51-31 over the Wolverines. 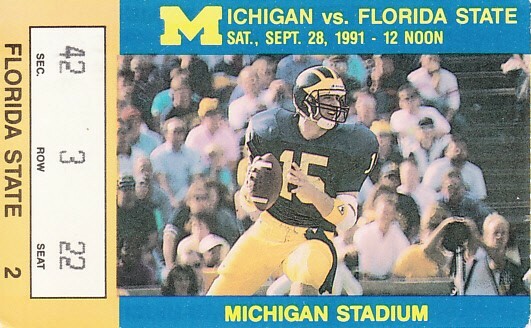 Both teams were loaded with future NFL players including FSU's Terrell Buckley and Edgar Bennett, and Michigan's Desmond Howard (1991 Heisman Trophy winner) and Elvis Grbac. Florida State finished the season ranked #4, Michigan #6. Has very minor flaws. ONLY ONE AVAILABLE FOR SALE.